What makes Barker Shoes the best pair of shoes you'll ever own? There is no doubt Barker Shoes are the work of skilled craftspeople, and the brand name is synonymous with quality. We wanted to go a step further and explain what makes Barker shoes so unique. Barker Shoes have been making high-quality leather shoes for men for over 100 years and were founded by a bootmaker in Northamptonshire. Northamptonshire itself has traditionally been a base for English boot making and is the home of multiple brands stocked at Robinson's Shoes, including Cheaney. Before it became a hub of British shoemaking, it was renowned for leather tanneries thanks to the multitude of local rivers. Barker set up home here, and to this day they manufacture their shoes on a 4.5-acre site near their original factory. Founder Arthur Barker was a craftsman and an innovator, and the evidence was in his early work. Even in its infancy, the brand stood out for developing a waterproofing system. Since then Barker has evolved, but they remain true to their quality roots. Barker Shoes are made using the Goodyear welt technique, which is older than the brand itself. Invented by Charles Goodyear in 1869, this procedure involves stitching the footwear in such a way that allows the shoes to be re-soled repeatedly. All-in-all welted shoes can take up to 8 weeks to make and the process is more expensive than machine moulding shoes. What makes the Goodyear method so successful is the durability it offers. Welted shoes are tightly sealed preventing water from entering, and they are also much more comfortable because they are made with a soft cork interior. Combined with Northamptonshire's legacy as a leather rich area, the marriage of craftsmanship and resources has proved vital to Barker's success. 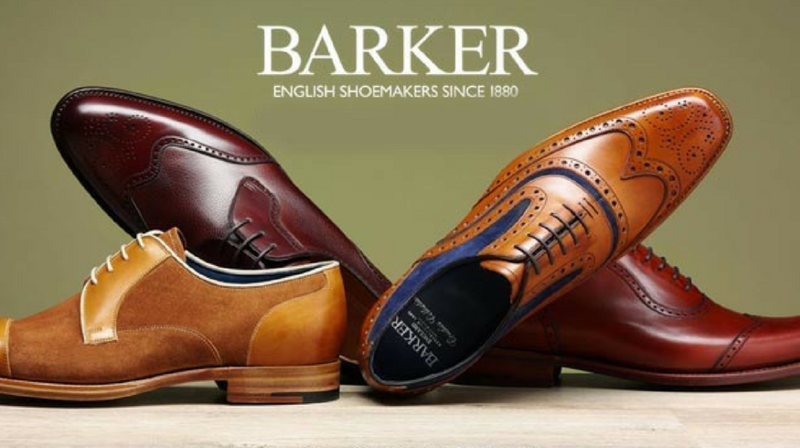 While Barker is a brand steeped in the history of British shoemaking, they are also at the forefront of modern design. When they built a new factory in 1987, they were careful to incorporate natural light into the modern design. The reasoning for this inclusion was to ensure they could match leathers and shades by eye, without too much artificial light distorting their environment. The results are shoes available in a range of exceptional hues; the Barker Vivaldi and McClean are great examples of this. The various leather finishes of both show the diversity of colours used in Barker's works. Barker are a beacon of consistency, in design, style and craftsmanship. Barker offer a shoe care service that is as high quality as the shoes themselves. If your shoe is in need of repair, you can send it back to the company for expert attention to detail. Barker endeavour to identify who made your footwear and put the same person to work fixing it.